He secretary of Nigeria Cassava Growers Association [NCGA] Mr Isaac Sunday Ojonugwa, has said that Ethanol fuel will save Nigeria an importation of kerosene and petrol of over $6.1 billion by 2012, adding that the development of a cassava based ethanol Bio- Fuel Industry will be a significant bonus for any Mrican Nation. While revealing this to newsmen in Abuja recently, he said a global ethanol production is estimated at 41 million tones valued at over $16 billion with a growth rate of 3 per cent per year but only about 10 percent of global ethanol productions are traded. Ojonugwa, however, said that the available statistics showed that not enough ethanol are available to meet export demand and a current supply deficit estimated at 6 billion litres is expected to grow by 5 per cent annually. 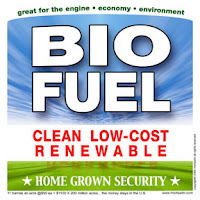 "Nigeria-made renewable cassava based fuel, ethanol will directly displace the amount of petrol and kerosene we need to import offering our country critically the needed independence and security from foreign sources of energy. The secretary disclosed that a U.S. consultant, SJH and Company, in 2002 studied that an approximate cost of $60 million of constructing an ethanol plant expands the local economic base by $110 million each year and ethanol production generates an additional $19.6 million in house hold income annually. Onugwa stated that agric-refinery or the bio-refinery is a factory that breaks down the celluloses and lignin in biomass and converts them into chemicals and fuels fibers, adding that Biomass resoures contain the same basic chemical of carbon, hydrogen and oxygen that constitute oil, in the form of cellulose, hemicelluloses and lignin. He further said that agriculture farmers who invest $20,000 in local ethanoliplant received an average of 13.3 per cent per year on their investment over ten years, saying that the local price of cassava increases by an average of 5-10 per cent tonne, adding significantly to farm income in the general area surrounding the plant.